Meeting in Kingdom Hall of Jehovah's Witnesses in the Netherlands. Most of their beliefs are based upon their interpretation of the Bible. These beliefs were taught by Charles Taze Russell, a preacher who started a Bible study group in Pennsylvania in 1876, and later started publishing a religious magazine called The Watchtower. Some of their beliefs, especially about who God is and what his plans are for humans and the earth, are different to what is taught in most Christian churches. Jehovah's Witnesses believe that only 144,000 people will go to heaven and that other people who obey God will live forever on a paradise Earth. They do not believe that God is a Trinity. They believe Jesus died on a pole (also called, 'stake') rather than a cross. They teach that when people die, they remain in their graves until Jesus resurrects them after God's Kingdom, or government, is ruling over earth. Jehovah's Witnesses are best known for preaching their beliefs from door-to-door and in other public places, and offering their magazines, The Watchtower and Awake! They are also well known for refusing to join armies and refusing blood transfusions. In 1870 a young clothing shop owner named Charles Taze Russell heard an Adventist preacher speak. The preacher said the Bible contained clues that showed God was about to set up a kingdom, or government, over earth. He said the kingdom, which is mentioned many times in the New Testament of the Bible, would be based in heaven, and it would completely change the way of life for everyone in the world. Russell studied that preacher's teachings and looked through the Bible, and ended up with some new beliefs. Using various Bible verses and events from history, Russell decided that God would soon call a group of "saints" to heaven to be kings there. Other faithful Christians who had since died would also make up a total of 144,000 kings in heaven. Churches at the time taught that humans were still waiting for Jesus to return to earth in his Second Coming, but Russell believed that clues in the Bible showed Jesus returned in 1874. Russell believed part of God's plan was to start Armageddon, which he thought would be a complete breakdown of law and order on earth, when governments and people would fight among themselves. He believed that God would then end sickness and death and allow obedient Christians to live forever in perfect health. Russell believed it was very important that all Christians, including those who were attending churches, should learn those "truths". He believed these "truths" had been carefully hidden in the Bible for thousands of years. He started a publishing group called the Watch Tower Bible and Tract Society of Pennsylvania. He wrote several books, set up some Bible study classes for people to study his teachings, and started a magazine, Zion's Watch Tower and Herald of Christ's Presence, which taught that Christ was already present. He wrote that God would bring about all those events by 1914. By the time Russell died in 1916, he had written 50,000 pages, with almost 20 million copies of his books printed and distributed around the world. Joseph Franklin Rutherford, one of his followers, took Russell's position as president of the Watch Tower Society. Rutherford wrote many books as well. He made some changes to Russell's teachings and required all the study groups, or congregations, around the world to agree to the teachings and rules set by the Watch Tower Society in New York. He told all members to preach from door to door about God's Kingdom and to sell Watch Tower Society publications so more people would hear the message. Many members did not agree with Rutherford's changes, and some started their own groups. In 1931 Rutherford called his group "Jehovah's Witnesses" to tell it apart from the other groups. By the time Rutherford died in 1942, the religion had a worldwide membership of 115,000. Some of the new teachings resulted in suffering for many Jehovah's Witnesses. Thousands were sent to prison, beaten or killed in several countries during World War II because they refused to fight. In Germany, many were sent to concentration camps because they would not support the Nazi Party. Later, in the United States, many of their children were expelled from schools because they refused to salute the flag, because they thought that God would not approve. Some countries still have laws against members practicing the religion. By 1977 they had more than two million members around the world. From 1966, the religion suggested that God could bring Armageddon in 1975, and that the Kingdom would be set up very soon after. Some Witnesses sold businesses and homes, gave up jobs, delayed medical operations and decided against starting a family because they expected Armageddon to arrive. The leaders later apologized, saying they hoped something would happen in 1975 because they were so keen for the Kingdom to come. Many members left at the time, but many other people joined and the group kept growing. Jehovah's Witnesses Kingdom Hall in New Zealand. Like many Christian religions, Jehovah's Witnesses believe there is an all-powerful, all-knowing God who created everything. They also have some beliefs that are different from most Christians. They believe God calls himself Jehovah (a translation of the Hebrew letters "YHWH") and they believe it is important to use that name. In which, 'God' is a title, as to, daughter, mother, father, son and etc. This is why it is important to address our father by his name. They believe Jesus is God's son, the first angel, and that he is also called Michael the Archangel. They say the holy spirit is God's power rather than a person. They do not believe in the Trinity. They believe the Bible is a book that God used humans to write and that it is completely true and the best guide for how people should live. Jehovah's Witnesses believe that God made Adam and Eve, the first humans, and put them in a garden called Eden. They believe that when Adam and Eve sinned, they no longer had God's approval so they began to get sick and die (death, which was one of the main punishments...among other things). They were no longer perfect and could not have perfect children, so humans would find it very hard to avoid sinning. They believe that Jehovah later sent Jesus to die (on a pole (stake), not a cross, as most Christians believe), which is known as 'Christendom'; to forgive mankind's sins. Jehovah's Witnesses believe that only 144,000 people, a number found in Revelation chapters 7 and 14, will go to heaven to be kings and priests with Jesus Christ. They say that God will start a worldwide war called Armageddon, and the people who do not obey God or worship him the way he expects will be killed. The people who he approves will survive and be given the opportunity to live forever. Then God will begin to turn Earth into a paradise without crime, sickness, pain, aging, wars or death. They say God will also resurrect (bring back to life) billions of people who died in the past so they can learn about God and have a chance to live in paradise as well. Jehovah's Witnesses believe only their religion really obeys God's instructions and that God does not approve of any other religions (including Catholics, Protestants, Buddhists and Muslims) because they do not follow the Bible the right way. They believe that Satan the Devil is the real leader of all other religions and makes them think they worship God the right way. (AKA: Satan the Devil is the ruler of this wicked world, but only for a short time). [better source needed] So they believe that only Jehovah's Witnesses will be saved at Armageddon, but they say God will make the final choice. 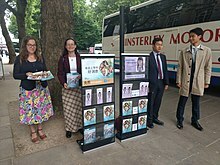 Jehovah's Witnesses offering their literature free of charge outside the British Museum in London, United Kingdom. Jehovah's Witnesses preaching house to house in Lisbon, Portugal. Jehovah's Witnesses are best known for their door-to-door preaching. They believe Jesus ordered them at Matthew 28:19 to "go make disciples of all the nations", warning people that the day of God's judgement, or Armageddon, will happen soon. Jehovah's Witnesses believe their preaching is a fulfillment of a prophecy at Matthew 24:14, "And this gospel of the kingdom will be preached in the whole world as a testimony to all nations, and then the end will come." All Witnesses are told to spend as much time as they can in public preaching work, usually offering The Watchtower and other Watch Tower Society publications. Since the Internet, Jehovah's Witnesses also preach online. They teach people their beliefs about Jehovah and his plans for the earth. Members are required to give a monthly written report on how much time they have spent publicly preaching. Members can also listen to the meeting over the phone. They also attend big conventions and assemblies several times a year (some of them at hired sports arenas), where thousands of members gather. Most meetings are based on articles in Watch Tower Society books and magazines about the Bible or Christian life. At some meetings, people in the audience, including children, are invited to answer questions and make comments. The religion has elders and ministerial servants (who are called bishops and deacons in some other Christian churches), but they do not dress differently to other members and they are not paid. Most elders support themselves with jobs outside the religion. Members of the religion are expected to live up to high moral standards. They are told they should always be honest. Jehovah's Witnesses are told to marry only other baptized Jehovah's Witnesses. They believe God does not like married couples to divorce unless the husband or wife cheated. They can separate from a partner who hurt their family or refused to support them, but they would not be allowed to marry someone else. They also refuse blood transfusions because the Bible says not to eat blood, and they believe that putting blood in their veins is like eating it. They are told not to make close friends with non-Witnesses because they could make their faith in God weaker. Jehovah's Witnesses are quite strict about who can be a member. Jehovah's Witnesses are only counted as members if they are baptized. Like other Christian groups, they believe baptism represents devotion to God and their promise to live by his teachings. Unlike some Christian groups, Witnesses are not baptized as babies. They believe baptism should be a choice made by someone who understands what it means. If the elders think a baptized Witness has broken the rules of the group or does not agree with all its teachings, they will investigate. That investigation is called a "judicial committee". If the elders decide the person is 'guilty' and does not regret what they did, he or she might be "disfellowshipped". This means the person is no longer a member of the group. When that happens, no other Jehovah's Witnesses are allowed to talk to or interact with that person (except in some situations such as living or working together) unless the disfellowshipped person repents and is allowed back in. Some people, including former Witnesses, have criticized this punishment as harsh and unfair. The style of leadership of the group has also been described by some authors as autocratic and totalitarian, because members have to be completely submissive to the leaders and must avoid criticizing the group or its teachings. ↑ "A sketch of the development of present truth", Zion's Watch Tower, July 15, 1906. ↑ Jehovah's Witnesses—Proclaimers of God's Kingdom. Watchtower. p. 42. ↑ Historical Dictionary of Jehovah's Witnesses by George D. Chryssides, Scarecrow Press, 2008, page xxxiv, "Russell wanted to consolidate the movement he had started. ...In 1880, Bible House, a four-story building in Allegheny, was completed, with printing facilities and meeting accommodation, and it became the organization's headquarters. The next stage of institutionalization was legal incorporation. In 1884, Russell formed the Zion's Watch Tower Tract Society, which was incorporated in Pennsylvania... Russell was concerned that his supporters should feel part of a unified movement." ↑ Religion in the Twentieth Century by Vergilius Ture Anselm Ferm, Philosophical Library, 1948, page 383, "As the [unincorporated Watch Tower] Society expanded, it became necessary to incorporate it and build a more definite organization. In 1884, a charter was granted recognizing the Society as a religious, non-profit corporation." ↑ Penton, M. James (1997). Apocalypse Delayed: The Story of Jehovah's Witnesses (2nd ed.). University of Toronto Press. pp. 13–46. ISBN 0-8020-7973-3. ↑ Franz, Raymond (2007). "Chapter 4". In Search of Christian Freedom. Commentary Press. ISBN 0914675168. ↑ Kaplan, William (1989). State and Salvation. Toronto: Univ. of Toronto Press. ↑ "Nazi Persecution of Jehovah's Witnesses". www.ushmm.org. Retrieved 2018-02-11. ↑ "Russia Jehovah's Witnesses ban in force". BBC News. 2017-07-17. Retrieved 2018-02-11. ↑ "Russia's ban is far from the only act of repression against Jehovah's Witnesses across the globe". Newsweek. 2017-05-05. Retrieved 2018-02-11. ↑ See "Witnessing the End" in the July 18, 1969 Time magazine. In the article it states,"Witnesses cautiously avoid a flat prediction linked to that year." Available online at: . Retrieved March 20,2017. ↑ Raymond Franz. "1975—The Appropriate Time for God to Act". Crisis of Conscience (PDF). pp. 237–253. Archived from the original (PDF) on 2003-12-09. Retrieved 2006-07-27. ↑ Holden, Andrew (2002). Jehovah's Witnesses: Portrait of a Contemporary Religious Movement. Routledge. pp. 151–4. ISBN 0415266106. ↑ Holden, Andrew (2002). Jehovah's Witnesses: Portrait of a Contemporary Religious Movement. Routledge. p. 24. ISBN 0415266092. ↑ Penton, M. J. (1997). Apocalypse Delayed (2nd ed.). University of Toronto Press. p. 172. ISBN 0802079733. ↑ Hoekema, Anthony A. (1963). The Four Major Cults. Grand Rapids, Michigan: William B. Eerdmans. p. 286. ISBN 0802831176. ↑ "Remaining Organized for Survival Into the Millennium", The Watchtower, September 1, 1989, page 19, "Only Jehovah's Witnesses, those of the anointed remnant and the 'great crowd,'as a united organization under the protection of the Supreme Organizer, have any Scriptural hope of surviving the impending end of this doomed system dominated by Satan the Devil." ↑ You Can Live Forever in Paradise on Earth,, Watch Tower Bible & Tract Society, 1989, pg 255, "Do not conclude that there are different roads, or ways, that you can follow to gain life in God's new system. There is only one … there will be only one organization — God's visible organization — that will survive the fast-approaching 'great tribulation.' It is simply not true that all religions lead to the same goal. You must be part of Jehovah's organization, doing God's will, in order to receive his blessing of everlasting life." ↑ "Our Readers Ask: Do Jehovah's Witnesses Believe That They Are the Only Ones Who Will Be Saved? ", The Watchtower, November 1, 2008, page 28, "Jehovah's Witnesses hope to be saved. However, they also believe that it is not their job to judge who will be saved. Ultimately, God is the Judge. He decides." ↑ "Do Jehovah's Witnesses Have Rules About Dating?". JW.ORG. Retrieved 2018-03-03. ↑ "What Does the Bible Say About Divorce and Separation? | God's Love". JW.ORG. Retrieved 2018-03-03. ↑ "Why Don't Jehovah's Witnesses Accept Blood Transfusions?". JW.ORG. Retrieved 2018-03-03. ↑ "School Friendships—How Close Is Too Close? — Watchtower ONLINE LIBRARY". wol.jw.org. Retrieved 2018-03-03. ↑ "Watch Your Associations in These Last Days | Study". JW.ORG. Retrieved 2018-03-03. ↑ Stark and Iannoccone (1997), Why the Jehovah's Witnesses Grow So Rapidly: A Theoretical Application (PDF), Journal of Contemporary Religion, pp. 142–143, retrieved 2008-12-30. ↑ "What Is Baptism? | Bible Questions". JW.ORG. Retrieved 2018-02-11. ↑ Holden, Andrew (2002). Jehovah's Witnesses: Portrait of a Contemporary Religious Movement. Routledge. p. 22, 163. ISBN 0415266092. ↑ Alan Rogerson, Millions Now Living Will Never Die, Constable, 1969, page 50. ↑ Beckford, James A. (1975). The Trumpet of Prophecy: A Sociological Study of Jehovah's Witnesses. Oxford: Basil Blackwell. pp. 89, 95, 103, 120, 204, 221. ISBN 0631163107. This page was last changed on 1 December 2018, at 00:03.